The authors aim to emphasize the important of a complete and exhaustive framework in order to find the cause of isolated hearing loss in an young patients, even if there is no familial history. Case Report: 20- year-old woman presented with isolated progressive bilateral hearing loss since the last six months. In the physical examination, otoscopy, acumetry and vestibular examination were normal. Audiometry confirmed bilateral hearing loss with a flat curve, but brainstem evoked response audiometry wave latencies and amplitudes and brain magnetic resonance imaging (MRI) were normal. Genetic study showed a mutation in the TNC gene. Discussion: TNC gene encodes tenascin-C, an extracellular matrix glycoprotein present in the human cochlea. This protein may have a role in the neosynaptogenesis after cochlear injury and in ionic homeostasis. In fact, TNC gene mutation causes a post-lingual autosomal dominant hearing loss." Sensorineural hearing loss (SNHL) in young patients is a challenge in terms of diagnosis, mainly if it is isolated (i.e., without any symptoms or signs of other diseases).Primarily, more frequent conditions like acoustic trauma and temporal bone trauma. Imaging exams (computed tomography – CT - or magnetic resonance – MRI) should be excluded, because up to 40% of the young patients with sensorineural hearing loss present altered anatomic findings in CT/MRI scan . It is mandatory also to investigate exposition to aminoglycosides; the most used antibiotics in neonatal sepsis . Intrauterine infections, such as cytomegalovirus (CMV), rubella, herpes, syphilis and toxoplasmosis, are also an important cause of hearing loss in children. CMV and rubella may have a delayed effect in audition . Autoimmune SNHL is another possibility. It may be isolated (autoimmune inner ear disease) or as part of a systemic syndrome. Its incidence may be underestimated because there is no gold-standard diagnostic test . Hereditary aetiology accounts for nearly 50% of sensorineural deafness cases in young people . Furthermore, reference to enlarged vestibular aqueduct (related to SLC26A4 gene mutations) remind the importance of genetic testing. TNC gene mutation is very rare. This gene encodes an extracellular matrix glycoprotein named tenascin-C, expressed in basilar membrane and the osseous spiral lamina in the human cochlea . A 20-year-old woman presented with bilateral hearing loss complaints in the former six months. She denied frequent and/or prolonged exposure to traumatic noise, vertigo, history of cranioencephalic trauma and perinatal infections. Normal full-term delivery. There were no familiar cases of early onset deafness known. Otoscopy, acumetry, vestibular tests and otoacoustic emissions hearing screening were normal. 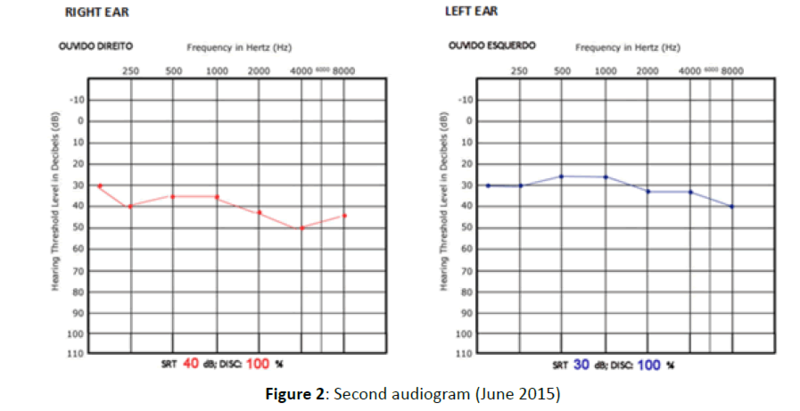 Audiometry confirmed bilateral hearing loss with a flat curve, which was moderate and sensorineural Figure 1. Five months later, hearing loss slightly improved, but did not change in the following three months, remaining bilateral mild-to-moderate Figure 2. There was no subsequent improvement after a 10- day course of steroid therapy (prednisolone 1 mg/kg per day). 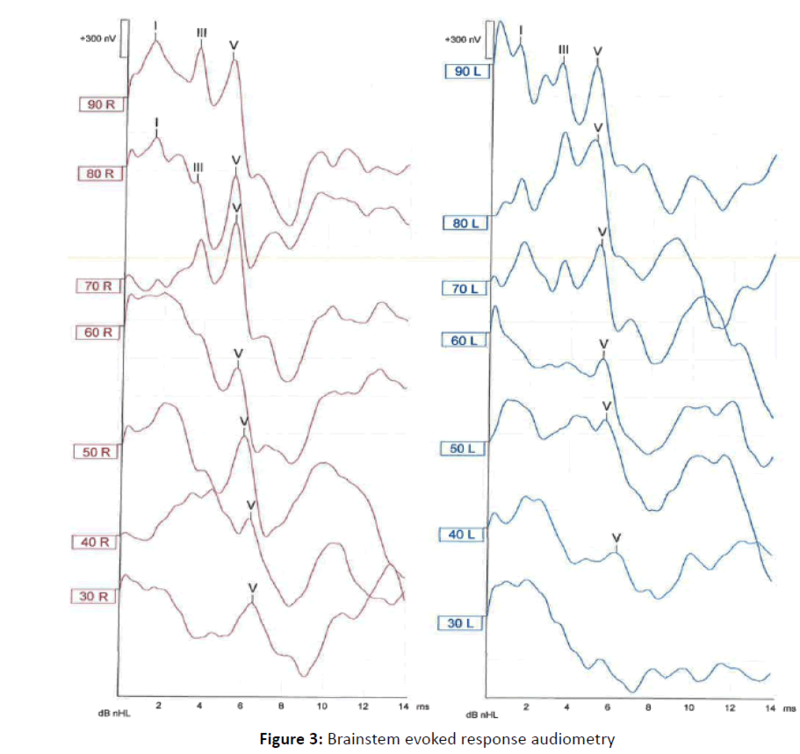 Brainstem evoked response audiometry (BERA) interpeak latencies and wave amplitudes Figure 3, brain MRI, electrocardiography (to exclude a prolonged Q-T interval: Jervell and Lange-Nielsen syndrome) and lab tests (hematology, biochemistry, thyroid tests, serological tests – VDRL, cANCA’s and antibodies to cochlear antigens) were normal. First genetic study (mutations in GJB2/6, SLC 26A4 and TECTA) was negative. A second genetic study, with a broad range panel of mutations of nonsyndromic autosomal recessive and dominant hearing loss, revealed a very rare heterozygous missense mutation in the TNC gene: the substitution c.1337G>A (p.Arg446Gln). The lack of noise-exposure history and the audiometric flat curve excluded a noise-induced hearing loss. In fact, the latter typically begins with impairment of hearing in the midfrequency range (3000 to 6000 Hz) . Demyelinating disease (such as multiple sclerosis), cerebellopontine angle tumours (most often, vestibular schwannoma) and enlarged vestibular aqueduct were excluded by BERA and imaging exams. Autoimmune deafness is characterized by a rapidly progressive fluctuating bilateral asymmetric SNHL that develops over several weeks to months4. Moreover, vestibular symptoms, tinnitus and aural fullness are present in up to 50% of patients , which is not the case of this patient. The symmetry of hearing loss and the lack of response to steroid therapy also made this hypothesis unlikely. Infectious diseases are also a very important group of hearing loss causes in young people. CMV is the leading cause of non-genetic hearing loss in children [4,7]. In this clinical case, serologic markers were negative. Considering the genetic causes, GJB2 gene (connexin-26) mutations are the most frequent . Generally, however, they are responsible for prelingual and severe to profound hearing loss . For the reason that tenascin-C is expressed in the cochlear basilar membrane, mutations in TNC gene loci may lead to disturbance of cochlear ionic homeostasis . Furthermore, tenascin-C seems to have a role in tissue remodeling after myocardial injury , so it may have a similar role (repairment after cochlear insult) in human cochlea. In fact, mutations in TNC gene are responsible for a post-lingual (onset between 8 and 30 years) and progressive autosomal dominant hearing loss , which is consistent with that hypothesis. A very important issue is the cost of screening of mutations. Sabatini et al. advocated an initial GJB2/ GJB6-directed test, because of its high diagnostic yield and low cost . However, Svidnicki et al. stated that the cost of routine screening of mutations in the GJB2 and GJB6 genes is approximately US$ 30 per patient, while the cost of screening of 86 genetic mutations in a panel including GJB2, SLC26A4, MYO15A, OTOF, CDH23 and TMC1 (which are the most frequent genes linked to autosomal recessive deafness) is approximately US$ 20 per patient . In Portugal, at CGC Genetics, complete sequencing of GJB2 and GJB6 genes has a cost of 110 and 120 euros per patient, respectively. Screening of mutations in a panel of 79 genes including GJB2, SLC26A4, MYO15A, OTOF, CDH23 and TMC1 is very expensive (above 1500 euros per patient), while screening of deletions and duplications (which are the most frequent deafness-related mutations) of GJB2, GJB6, GJB3, POU3F4 (X-linked deafness) and WFS1 (autosomal recessive deafness) is cheaper (150 euros per patient). Therefore, an accurate anamnesis is critical to avoid superfluous costs. A broad and exhaustive workup is crucial in early onset hearing loss cases. Genetic study has a crescent importance in diagnostic search. There are a myriad of proteins evolved in the hearing process. Therefore, the trend is to find mutations in genes encoding more and more proteins evolved in cochlear homeostasis as knowledge about cochlear physiology and histology is in progress. TNC gene mutation is a possible cause of hearing loss in postlingual onset cases which etiology seems very hard to find. More investigation is needed to clarify the actual role of tenascin-C in cochlear homeostasis and integrity. Mafong DD, Shin EJ, Lalwani AK (2002) Use of laboratory evaluation and radiologic imaging in the diagnostic evaluation of children with sensorineural hearing loss. Laryngoscope 112: 1-7. Bitner-Glindzicz M, Rahman S, Chant K, Marlow N (2014) Gentamicin, genetic variation and deafness in preterm children. BMC Pediatr 14: 66. De Leenheer EMR, Janssens S, Padalko E, Loose D, Leroy BP, et al. (2011) Etiological diagnosis in the hearing impaired newbord: Proposal of a flow chart. Int J Pediatr Otorhinolaryngol 75: 27-32. Mijovic T, Zeitouni A, Colmegna I (2013) Autoimmune sensorineural hearing loss: The otology-rheumatology interface. Rheumatology (Oxford) 52: 780-789. Zhao Y, Zhao F, Zong L, Zhang P, Guan L, et al. (2013) Exome sequencing and linkage analysis identified tenascin-C (TNC) as a novel causative gene in nonsyndromic hearing loss. PLoS One 8. Ali S, Morgan M, Ali UI (2015) Is it reasonable to use 1 and 8 kHz anchor points in the medico-legal diagnosis and estimation of noise-induced hearing loss? Clin Otolaryngol 40: 255-259. Goderis J, De Leenheer E, Smets K, Van Hoecke H, Keymeulen A, et al. (2014) Hearing loss and congenital CMV infection: A systematic review. Pediatrics 134: 972-982. Sabatini LM, Mathews C, Ptak D, Doshi S, Tynan K, et al. (2016) Genomic sequencing procedure microcosting analysis and health economic cost-impact analysis: a report of the association for molecular pathology. J Mol Diagn 18: 319-328. Svidnicki MC, Silva-Costa SM, Ramos PZ, dos Santos NZ, Martins FT, et al. (2015) Screening of genetic alterations related to non-syndromic hearing loss using MassARRAY iPLEX® technology. BMC Med Genet 16: 85.